I think the island of Saint Martin, (using the French spelling here) may be the smallest island to have a national border running through it. According to sources such as Wikipedia, the land totals under 100 km2, with the French side (the North) having the larger share. The current name of the island goes back to Columbus first sighting it on St. Martin’s day, 11th November 1493. Although Columbus did not land, he claimed the island for Spain. It was the Dutch though that were the first to establish a colony. Previous inhabitants of the islands had called it Soualiga, meaning land of salt as the island contains many salt pans. As with most of the Caribbean, the local inhabitants were mainly wiped out by a mixture of disease and guns, while large numbers of slaves were imported from Africa to operate profitable plantations. The Spanish finally decided they wanted the island and conquered it in 1633, mainly to use as a strategic point in their wars with the Dutch. When the war was concluded, they found it unprofitable and left. Before Spanish occupation, both the Dutch and French had footholds on the Island. As attempts by each to gain full control led to a stalemate, they eventually decided to split it in two. Unlike the judgement of Solomon, in this case splitting in two works, even if over the years there has been conflict over the borders. Neither side of the island has become an independent state. The remaining French territories in the Caribbean are all integrated into the French state, taking parts in elections for the French president and government. There is some discrepancy between those areas such as Saint Martin that are termed Special Collectivities, and those which are Regions in their own right (the larger areas, Martinique, Guadeloupe and French Guyana).The Netherlands also has two different levels of status for its Caribbean possessions, Sint-Maarten, along with Aruba and Curacao are all countries within the Kingdom of the Netherlands, while smaller islands of Bonaire, St Eustatius and Saba are municipalities with greater direct control from the Netherlands. The French territories are all part of the European Union and use the Euro as currency. This means their citizens are all citizens of the European Union. The Netherlands side is somewhat different, and there is such a thing as Sint-Maarten’s citizenship, (more on this later). It is still common for young people from Sint-Maarten to travel to Europe, particularly to the Netherlands for further education. Tourism is now the biggest contributor to the economy, and the Dutch understood it’s coming two decades before the French. As a result, the Dutch side of the island appears to have an advantage, with the larger airport and the terminal for cruise ships. Hence most visitors to the Island will arrive on the Dutch side. I was one of those and this helped me on my opening day as I was watching the Sint Maarten national team, even though the match was being played on neither side of the island, but on neighbouring Anguilla. After one night, I switched to the opposite corner of the island. This was mainly on the basis of economy, but factors such as proximity to the beach and even the fact that I can still use my mobile phone freely help. 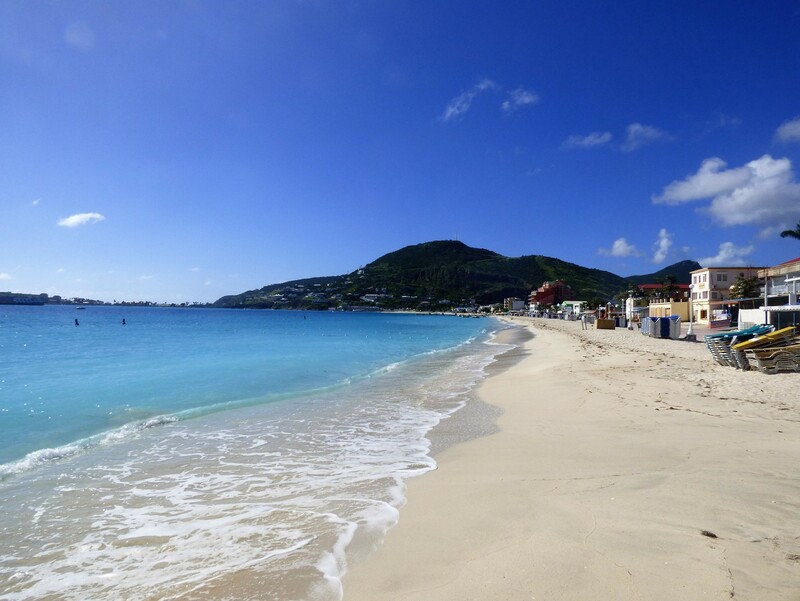 SXM is the airport code for the island’s major airport, on the Dutch side. The initials are also used for the island as a whole or for the Dutch side alone. The football association on the Dutch side shows the initials SXMFF for Sint Maarten Football Federation on their shirts. 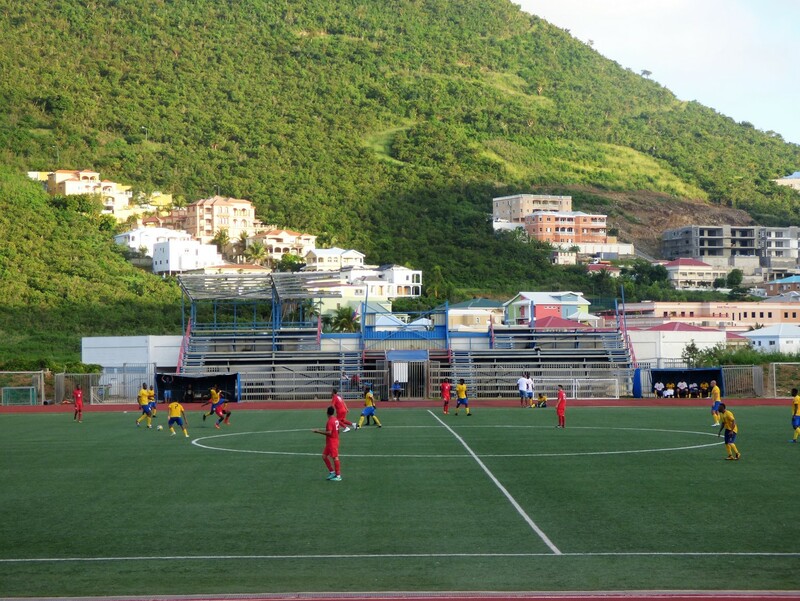 Football wise, both Sint Maarten and Saint Martin are members of CONCACAF, but neither has been able to join FIFA. These are two of the six CONCACAF nations with this situation. The larger French territories account for three more, while the final one is Bonaire, the Netherlands municipality. Of the six, it appears that Sint Maarten is the closest to matching all FIFA’s rules for membership and they feel they can achieve this within the next couple of years. Their status is after all, the same as Aruba and Curacao which are both FIFA members. Also, six British Overseas Territories in this region are FIFA members. There is a difference in the way Saint Martin is portrayed by the French Football Federation to the three regions. When I wanted to check the fixtures and results in Guadeloupe, Martinique and French Guyana, I simply had to go to the French Football Federations website, and all was there for me to see. Saint Martin, and the nearby island (also a collectivity) of Saint Barthelemy are absent. For Saint Martin, with no senior league at the moment and the junior fixtures apparently arranged week by week this is not entirely surprising, but St. Barthelemy was one of the first places to send me the current fixtures. I did investigate crossing there for a game, there are ferries during the day from Saint Martin, but the games were under floodlights meaning an overnight stay and I do not think I found any accommodation under around £400/night! Anyway, my accommodation on Sint Maarten side was not up to the price paid, so I was pleased to cross the border. Ignoring all local advice (except some of the web sites), I simply made my way to the bus stop. Almost immediately a bus came to take me to Marigot, the capital of the French side. I think I was a bit lucky there as I was expecting to have to go via Philipsburg, the capital on the Dutch side. The bus driver did offer to take me onto my destination for another $20, (which I later discovered is the taxi fare), but I declined, saying I could get another bus. He then operated the route I wanted as a bus, but left before the man at the bus station could explain that bit. Still five minutes later, a bus came and took me to Orient Bay for another $2. (He would also have accepted €2). I had to walk five minutes to find my accommodation, but all went well. So, for six nights, I was in a good-sized apartment, one of six making up a single block around a small swimming pool. This was a five-minute walk from the centre, which has a beach and a few restaurants, bars and shops. Apart from that, and a couple of high-end hotels, there is not a lot here. I did not travel away until the Saturday, which is of course football day. The landlady had booked a taxi to take me to Marigot, which was important as I had need of a cashpoint machine. This time I had made certain I had more than one card in case of problem and I still worried a little when the taxi stopped at a machine about half-way there which would not stump up any cash, but when I reached town, I managed to withdraw funds with ease. The town itself I quite small, but as befits the French, it has a mall and several shops selling fashions and perfumes. Once I had confirmed I was not going to get a coffee in the air conditioning of the mall, these were of little interest to me. Instead I made the walk of around 20 minutes to what, before the hurricane was the main stadium, the Stade Albertic Richards. 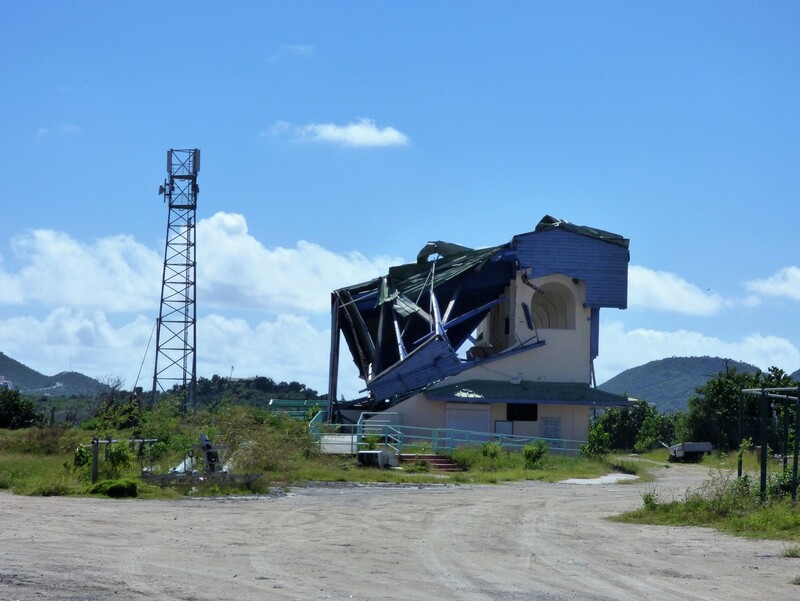 More than a year after the hurricane struck, repairs have not started and it may be years before this venue is reopened. 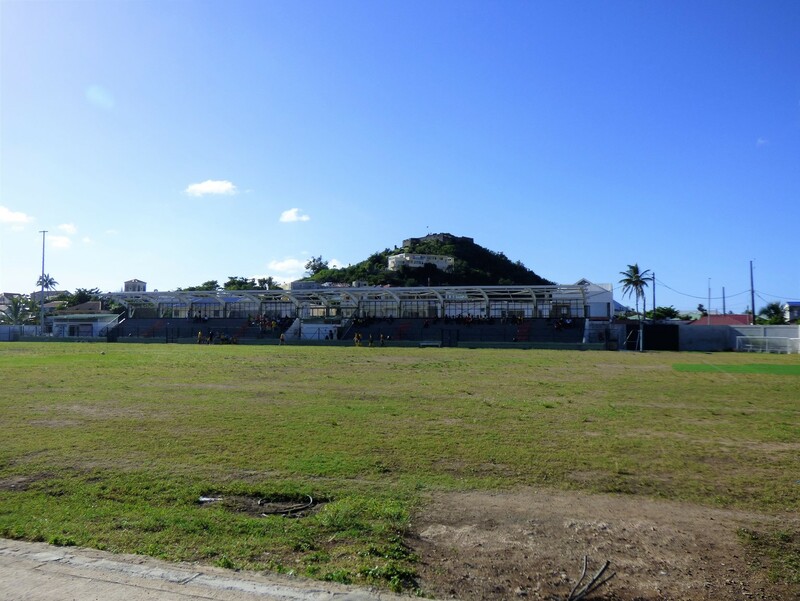 The artificial surface has been removed, and now lies in heaps at the Marigot stadium. The base layers it was laid on have become overgrown in the meantime. Floodlight pylons lay brought down by the storm have been laid down at one side. It is as graphic reminder as anything of the force of the storm that devastated the island. From here, I took the bus back into town. It had been only a 20-minute walk out, but in the heat of the midday sun, I was worried that to continue walking might make me feel more of a mad dog than an Englishman. For a short journey, the fare is just one dollar. In town, I wandered around a little before being persuaded to stop and take something to eat and drink at one of the many open fronted restaurants that make up the centre. Once I had taken my fill, I headed down to the Marigot stadium, where I had a plan to meet up with Steven Tackling, general secretary of the Saint Martin FA. The stadium has suffered less than the bigger one down the road. 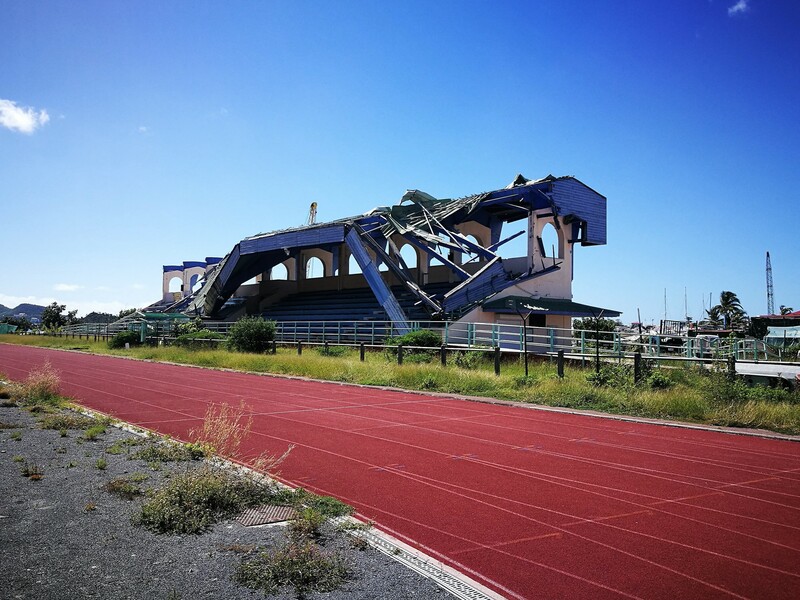 Its main stand is intact, except the roof itself is completely missing. This stand provides a few steps of concrete seating, and runs most of the length of the pitch. Opposite this is a relatively recently erected barrel roof, which I am assured was but in before the hurricane and survived intact. It is not part of the stadium, more the sports centre as it covers had courts for basketball, volleyball and hockey. 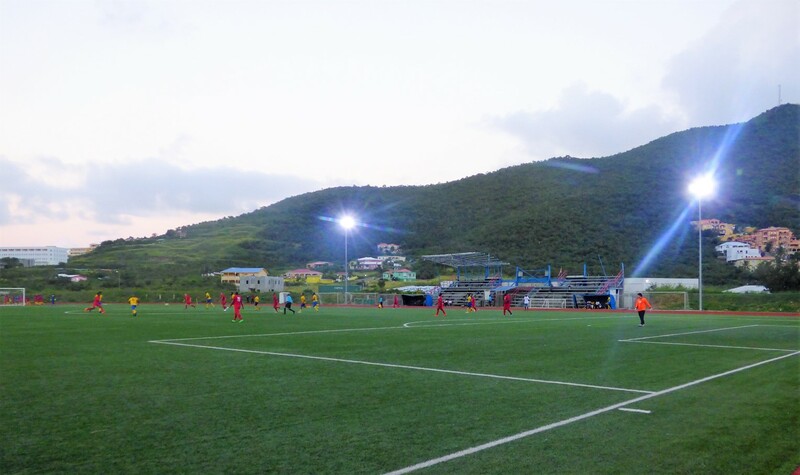 The pitch is in use from early morning to sundown, starting with the younger age groups playing small sided games across the pitch, and then three matches for under 15 teams playing 35 minutes each way. I do not include such matches on my full log, so none of the rigmarole of trying to get the players names, or checking on substitutions. During the week, the pitch will also get heavy use by schools and by the teams training, so it is no surprise that the playing surface is in such a poor condition. Laying a couple of patches of artificial grass in the goalmouths without the requisite works underneath is only a minor help. Nethertheless, the kids playing are showing a degree of skill when on the ball. Passes will go astray on such a surface, the remarkable many do not. It seems to me that they have the basic skills of the game right, but there is a lack of vision in the play. The players on the ball are not aware of where their colleagues are, and the players off the ball are not thinking how best to position themselves. When I talk to Steven Tackling, he explains that they are trying to get Senior football going again, but with only this one pitch this is clearly a problem. They do not expect to get the main stadium pitch, or another one in another part of the island operational at any time next year. Meanwhile, with senior football on the Dutch side having restarted, many players have “defected”. The association, along with the three other French associations in the Caribbean would like to apply for FIFA membership, but the French Football Federation itself is not in favour. As none of these associations are full members of FIFA, and all of their citizens are French citizens, the French team can call upon Caribbean players even after they have played for the local teams in CONCACAF competition. FIFA membership would also mean far more players in metropolitan France may look at their ancestry and find themselves eligible to play for the Caribbean sides. For example, Raphael Varane of Real Madrid and France could have played for Martinique instead. However, when you consider the number of players in the French national team that could have played for independent countries such as Senegal, you would say this is not really a reason to oppose. There is still the question as to whether FIFA would accept the autonomous but not fully independent countries of the world into the fold again, after deciding to block them in a failed bid to keep out Gibraltar (and appease Spain). A rule change may not help Jersey, whose recent application was rejected, but for the countries in the Caribbean, and for Greenland, there would then be hope. 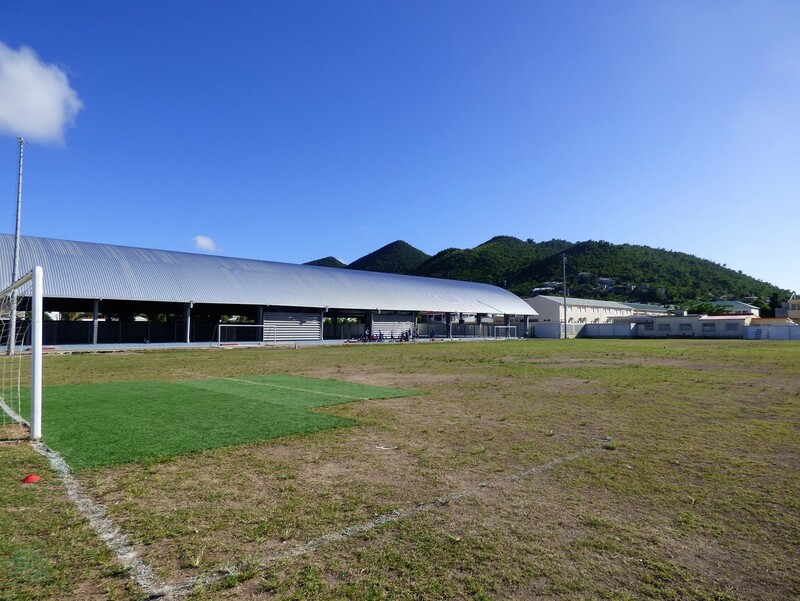 Saint Martin is not, however a land that FIFA has forgotten. Simply one that they consider part of another country (France). There was a promise of a grant from FIFA to help with rebuilding immediately after the hurricane, but I was told that not a penny has reached the island yet. Again, it appears the local believe the fault is with the FFF, through which any FIFA funds would have to be re-routed. I was lucky to get talking to one of the parents supporting his child at the game. Bertrand Peters is a father who is clearly proud of his children’s achievements. Although he did not mention it, from his name and employment, he is Dutch side, but his family is cross border. He had a son on the pitch who had played for an under-13 side earlier in the day, and was now turning out for the under-15s – even scoring a goal in their 4-1 win. His 17-year-old daughter has a problem though. She has been playing in junior football, where the teams are mixed – but there is no progression on the island with a shortage of ladies’ teams to play in. She is hoping to move abroad to continue education and football and he said he was trying to get her into a scheme at FC Groningen. Anyway, this was a real help to me, as my new friend drove me from Marigot – firstly to the cricket ground on the Dutch side, where his daughter and some of her friends were watching an over-35 inter-island competition. Then having seen only the last couple of overs, we went down to the football stadium and watched my first (of three) game in the SXMFF League. This was FC Soualiga v United Superstars. It did not live long in the memory, two reasonably matched teams struggling to find a way through each other’s defence. It was settled with two goals from Yannick Bellechasse, one shortly before the break and a second around the hour mark. Soualiga, I was told have quite a lot of national squad players, but these are mainly from the youth squads, and United Superstars greater experience held sway. Three of the Soualiga players had played for Sint Maarten in Anguilla, with one more on the Souaglia squad list but not playing this game. Judging by the players’ names, United are one of the teams with a significant presence from the French side of the island, with the goalscorer being the one I could confirm as he had played for Saint Martin’s international side in their last game. While watching the match, I chatted to my new friend, and drank a bottle of Mackeson stout. (Once an archetypal English brew, now almost forgotten about at home, but still brewed and drank out in the Caribbean). My friend then went around the island to take me back before taking himself and his daughter home. The next day, the plan was to go back to the Raoul Illidge Sports Centre with two more games scheduled. This time I was on my own, transport wise, and I chose to try out the local bus services in earnest. This is actually quite simple, there is just one route that goes along the main road. Just as I arrived at the road, there was a bus – it was going the away from Marigot, but a quick enquiry with the driver confirmed that when this reached the end of the line, I would be able to get another to Philipsburg, the capital of the Dutch side. This worked perfectly, with just a small wait between buses. Philipsburg itself consists of a few streets between the sea and “the great salt pond”, which I believe does exactly what it says on the can. It seems the streets are placed in order the Boardwalk or beach front is not surprisingly full of beach bars and restaurants – but on a Sunday with no cruise ship in town, most were closed. The next road, Front Street contains the posher shops and the casinos – walk further from the beach and you get to Back Street (some originality on names here), which has the more basic shops. 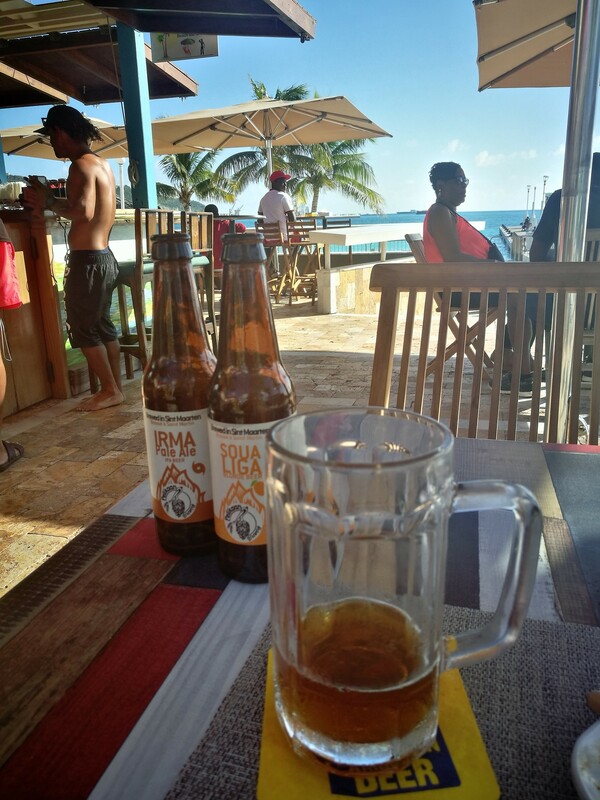 Although most of the bars were closed, but when I found one that was open, I was glad to discover that it sold some of the local beers, from the only brewery on the island. This is a craft brewery and I sampled two different unfiltered beers. A very hoppy IPA named “Irma” (as in the hurricane), and a blonde beer by the name of “Souaglia”. After I had eaten, then it was a simple matter of trying to find my way to the stadium. I did not fancy trying to walk it, even though my phone thought this was well within my capabilities, so I stopped the first bus that came past. Yes, he says, I can take you to the end of the road for the stadium for the princely sum of $1.50. That is good enough for me. Just a five-minute walk then, and I arrived at the stadium that was looking somewhat underwhelmed by the occasion. Through the gate I had used the day before, I could see only about two or three people in the stand. The gate, however was locked. Walking around, there were a couple of people waiting, and they did confirm there was supposed to be football on at 4 p.m. Twenty minutes to kick off normally means someone warming up on the pitch, but none was to be seen. I find my way in, and the home team, C&D Connection appear to be all present and correct, but I quickly discover that the opposition, Funmakers are somewhat short. Indeed, the official kick off time comes and goes and there are only about six players in the dressing rooms. The referee and his assistants are quite clear that the rules allow 15 minutes after kick-off, and I am relieved that in that time more turn up and we do indeed have a game. With very specific rules demanding that the referee checks players ID before kick-off, the process is slow and when the game starts, we are close to 30 minutes behind schedule. I check the team lists now, and while C&D show a full squad of 16, including five substitutes, Funmakers have only ten on the field. They do name two substitutes, but these never actually arrive and they play with the same ten for the entire ninety minutes. 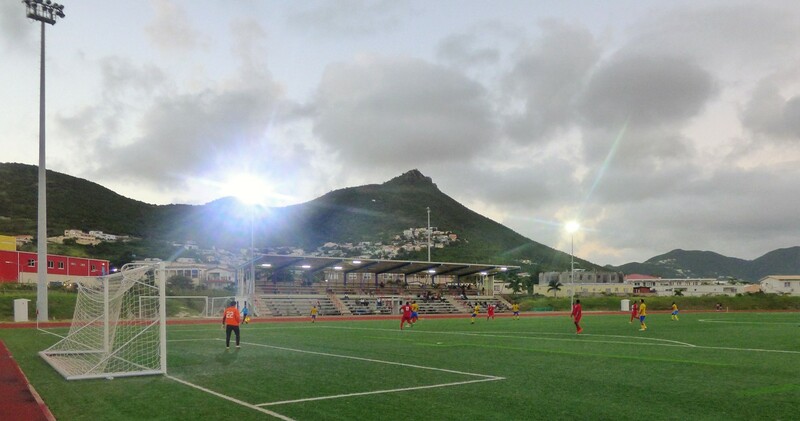 Both included one player from the Sint Maarten international squad on the Tuesday, although only the Funmakers’ player had played in Anguilla. The stadium is an artificial pitch within a modern running track. The main floodlight pylons were lost in the storm, with only one upright, but four temporary pylons have been installed in its place. These provide sufficient light for the fixtures. The artificial surface shows signs of repair from damage caused during the hurricane. There are stands on both sides, but the older one can not be used. It has no roof and the supports for the roofing have been lost at one end. Underneath this are the dressing rooms, which must be a factor in what they need – which is to demolish this and build anew. When I asked about the fact that this ground cannot hold the CONCACAF matches, despite it having more spectator accommodation that in Anguila, I was told that it the lack of ancillary facilities. There are no rooms at the stadium for the post-match press conference, nor for match commissioners and delegates. On the opposite side is a fine stand with concrete steps on a steel framework. It provides seats for all who want them, and is fully covered. Even when it is not raining, cover is important to shade you from the sun. Having said that the sun dropped behind one of the large hills and left the pitch itself in shade after about 5 p.m. One does wonder about the choice of 4/6 o’clock kick offs, what mean half of the first match is played in the glare of the sun, when 5/7 seems more suitable. The Saturday night game itself was a 7 p.m. kick off, after all. With only ten men, and a squad that I am told is made up of some of the older players on the island, Funmakers have no fun on the field in the early part of the game. Particular credit goes to Lavor Grant, who was the front man in the C&D 4-2-3-1 formation. He opened the scoring and went on complete his hat-trick within sixteen minutes of the start. Two other players got in on the act, and it was 5-0 after just a quarter of the game had been played. After that, it appeared some of the teamwork went out of the match, with the Connection players all wanting to grab a goal for themselves, but the real change to the match came in the 35th minute. A rare Funmakers attack was stopped by centre half Nikola Radejevic who was booked for the foul. To say he was not happy with the decision would be an understatement. Hence, I do not think he received a second booking, but instead it appeared that the referee added a straight red. He had to be physically ushered off the field by his team mates. Grant was pulled back into the surely unnecessary role of centre half continuing to snuff out the non-existent threat. As a result, only one further goal is added, mid-way through the second half when a penalty is awarded to C&D Connection and is converted by the goalkeeper, even though his opposite number did get a hand to it. During the game, I was talking to Sudesh Singh, the president of the local association. He told me that the second game of the day should be more interesting and competitive. He was not wrong there. He may be president of an association, but he still can only sit on the concrete steps with everyone else. The only person who has an actual chair is Michael Dort, the only paid official. He does the administration and sits on the opposite side of the grounds with the team lists, even raising the boards for substitutions in the first game, when we have only three officials. The assistant referees are the same for both games (and for the game the previous night), but they have managed different referees for each game. 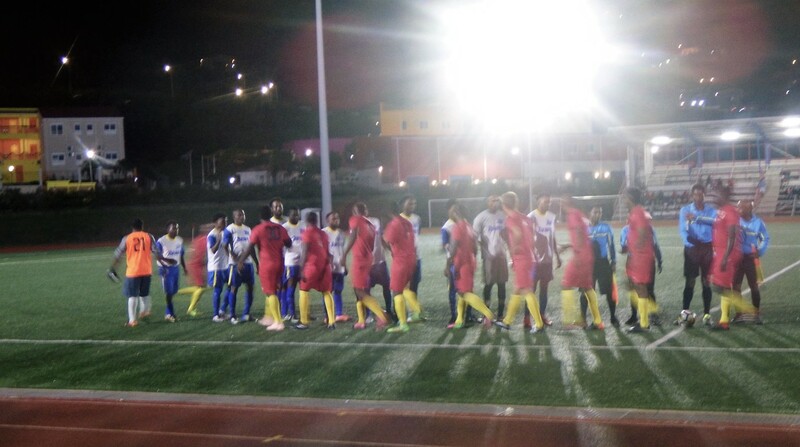 At the moment, the Sint Maarten national side relies on players who play locally, and a few who have recently moved away. It is not easy to maintain a side when a large portion of the players leave the islands for further education in their late teens and early twenties. This means, of course that there will always be a pool of eligible players who now feature in European football, mainly the lower divisions in the Netherlands. Similar to my experience with Antigua and Barbuda, who fielded a few players from lower divisions in the Football league, and others from clubs such as Ebbsfleet and Nantwich. If Sint Maarten can gain full FIFA recognition, then it would be easier for them to select from these players. Sudesh Singh explained that Sint Maarten nationality laws further reduce the numbers of potential players. They have laws that mean that many children who have been born in Sint Maarten and have lived their all of their lives have not become citizens as their parents were not citizens. In some cases, this must cause problems if they cannot prove citizenship of another island. In my understanding, this felt similar to the laws in Germany before they reformed at the beginning of the century – a move that allowed more footballers of Polish or Turk ancestry to qualify for the national team. A year ago, I might have tried to be smug in saying we don’t do this in Britain, but that would have been before the Windrush scandal broke. According to Sudesh, FIFA are now actively helping get the application right. It does not appear to be a simple matter. He thinks it may get approved in 2020. Meanwhile the full membership of CONCACAF and the loose connection with the Netherlands association. Experienced coaches come across from the Netherlands, and this has resulted in all the teams having a coach who has passed CONCACAF coaching course. Onto game two, and with a good crowd now in attendance. In the gangway below the centre of the stand, there is a good business selling beer and food. The crowd is boisterous, but friendly and the majority appear to support 758. Their team has the upper hand throughout the first half, and the game is played at a much greater pace than the others I have seen here. Both teams can provide much more movement and far fewer passes go astray. The habit of players running into offside positions is still there, and they do need to work better off the ball, but this is a much more exciting and entertaining game. It takes until the 38th minute to get a goal, and at this point there is a lot of cheering as 758 are leading. They double this is first half injury time, so take a comfortable lead into the break. Both teams are playing just one forward in the first half, but the speed at which the 758 midfielders move in support is a reason for their dominance, Flames change after the break into a formation more akin to 4-4-2 and commit more to attacking, this pays off with a penalty eight minutes after the break and a deflected goal halfway through the half. With the score at 2-2, the game could easily go either way in the last twenty minutes. To the great glee of the crowd, it is in fact 758 Boys that complete the goalscoring with a goal five minutes from the end. Getting back to accommodation from here is more of a rigmarole that I had hoped for. The bus driver that dropped me seemed to say I would have little trouble getting a bus to Marigot later, but it was not that simple. As I arrived at the stop, there was a bus there – but this was waiting for assistance as a car had just hit him from the side. It was only a minor dent to the bus, but he was waiting while someone came out to check the damage. In the twenty minutes that followed, no buses went past going up to Marigot, although I did see a couple heading in the opposite direction. I also saw no taxi pass by. When the first bus disappeared, it went in the wrong direction, but a couple of minutes later it was back (with one other passenger) and took me to Marigot. I am not certain where it went exactly as it did not disappear for long enough to get to the terminal and back. 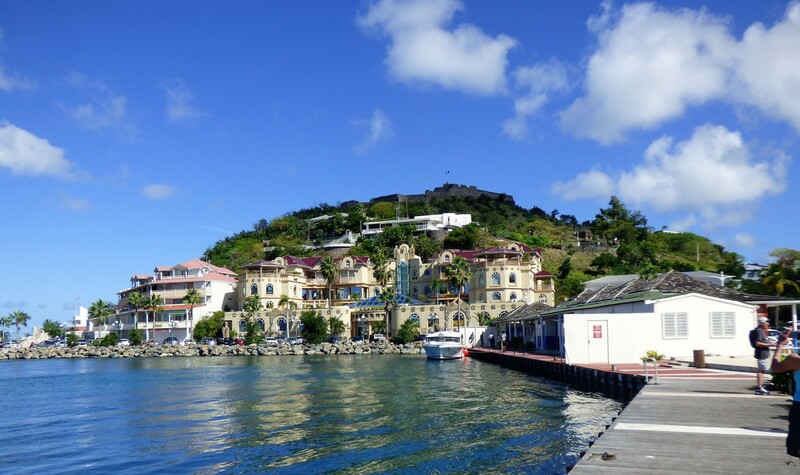 While on the Dutch side of the Island, there appeared to be plenty of life, with a restaurant open near the stop and other bars passed on the route, Marigot was almost a ghost town, considering it was only around 9.30 at night. Clearly no buses were to be had, and as I headed into the centre there was no sign of a taxi either. Most of the restaurants were closed, and the others were waiting for their last guests to leave. Fortunately, one did call a taxi for me, for which I had to pay the late evening rate, I could not argue as there were no alternatives, and if I had called for a different cab, then late evening would have applied by the time it arrived. This entry was posted on Thursday, November 29th, 2018 at 04:07 pm and is filed under ATW90. You can follow any responses to this entry through the RSS 2.0 feed. Both comments and pings are currently closed.